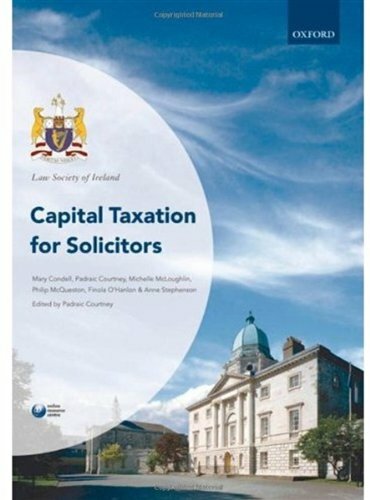 Capital Taxation for Solicitors offers succinct and practical advice to trainee solicitors enabling them to gain a thorough understanding of the main capital taxes.This manual is essential reading for all students on the Professional Practice Course Part 1 and will also be a useful reference tool for practitioners. This book has been written as a companion manual to three others also in the Law Society of Ireland series: Conveyancing, Landlord and Tenant, and Wills, Probate and Estates. In relation to probate, this book provides a thorough explanation of capital acquisitions tax comprising gift tax, inheritance tax, and discretionary trust tax, and goes on to detail the taxation consequences across a variety of taxes in relation to will drafting and estate planning, and administration of the estate, including the break up of settlements. In relation to conveyancing, it gives a thorough explanation of capital gains tax and stamp duty as these taxes relate to conveyances of residential properties. The manual also outlines the VAT consequences of various transactions in the context of landlord and tenant work. The manual will be updated regularly via the accompanying Online Resource Center. View More In Tax Law.